“Oregon is already experiencing statewide impacts of a changing climate.” Thus begins the Fourth Oregon Climate Assessment Report released in January of this year. Mote, Philip W., John Abatzoglou, Kathie D. Dello, Katherine Hegewisch, and David E. Rupp. “Fourth Oregon Climate Assessment Report, Oregon Climate Change Research Institute.” Corvallis, Oregon: College of Earth, Ocean, and Atmospheric Sciences, Oregon State University, 2019. http://www.occri.net/ocar4. However, the report notes, while climate change has touched all corners of Oregon, some communities are more vulnerable than others. These frontline communities are experiencing the first, and often the worst, effects of climate change impacts. Frontline communities include the economically disadvantaged and those who depend on natural resources for their livelihood, among them rural residents, including Native Americans. Fourth Oregon Climate Assessment Report comes from the Oregon Climate Change Research Institute (OCCRI). Its authors include OCCRI and CIRC’s Philip Mote, Kathie Dello, and David Rupp at the Oregon State University and CIRC’s John Abatzoglou and Katherine Hegewisch at the University of Idaho. Consisting of two chapters, the report represents a convergence of evidence of the risks that Oregon is facing and will continue to face under a changing climate. Chapter 1 summarizes the current state of knowledge of the physical changes in climate and hydrology, focusing on what has been learned since the previous Oregon Climate Assessment Report. The report’s second chapter covers impacts, reprinting verbatim, the Northwest chapter of the Fourth National Climate Assessment (NCA4), which was released by the federal government in November 2018. 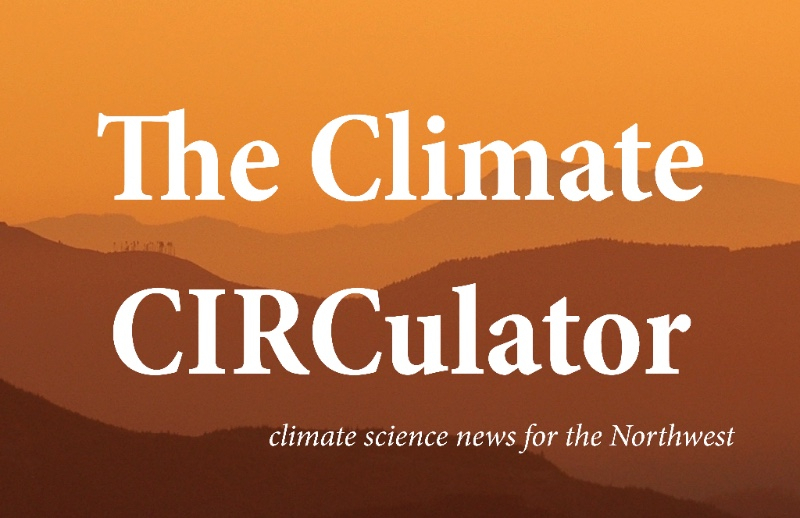 CIRC’s Northwest Climate Toolbox features prominently in the report. Data, figures, and maps were taken directly from the Toolbox to communicate the latest climate projections for several variables, including the frequency of hot days, growing season length, snow water equivalent, soil moisture, streamflow, and fire danger. OCCRI produces a climate assessment report for Oregon lawmakers every couple of years as required by state law. A PDF of the report can be downloaded at www.occri.net/ocar4. A web version of the report is coming soon. We’ll keep you posted. Publication: Mote, Philip W., John Abatzoglou, Kathie D. Dello, Katherine Hegewisch, and David E. Rupp. “Fourth Oregon Climate Assessment Report, Oregon Climate Change Research Institute.” Corvallis, Oregon: College of Earth, Ocean, and Atmospheric Sciences, Oregon State University, 2019. http://www.occri.net/ocar4. Meghan Dalton is a lead author of the Tribal Climate Adaptation Guidebook and the Third Oregon Climate Assessment Report as well as a co-author on the Northwest chapter of the Fourth National Climate Assessment. Her other publications include the extended report Climate Change in the Northwest: Implications for Our Landscapes, Waters, and Communities. A climate researcher with a BA in Mathematics and a MS in Atmospheric Science, Meghan has worked on Community Adaptation projects with several Pacific Northwest communities, including the water provider Seattle Public Utilities for the PUMA project.